The Sausage Rally was held not far from Axminster at Curlew Farm. The views were good and the weather was great. 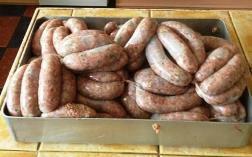 Twelve vans attended and we tasted many different varieties of sausage including venison. It was a busy rally. Four of us visited Palmers Brewery which included a gift of a tankard and the chance to sample some of their range. Following which we went over to Lyme Regis and enjoyed fish & chips and a cup of tea on the front. We celebrated Jenny's 50th birthday, and Mike's & Jenny's 31st Wedding Anniversary. We enjoyed a cream tea, a meal at a local pub, plenty of sausages and sampled various types of game. The clay pigeon shooting was good, not that we hit much but it was great fun! Looks as though a great time was had by all??? ?